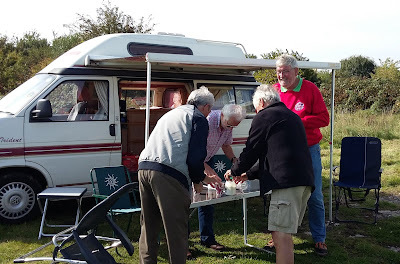 The Vintage Glider Club re-convened today for some more fun in fabric and wood. 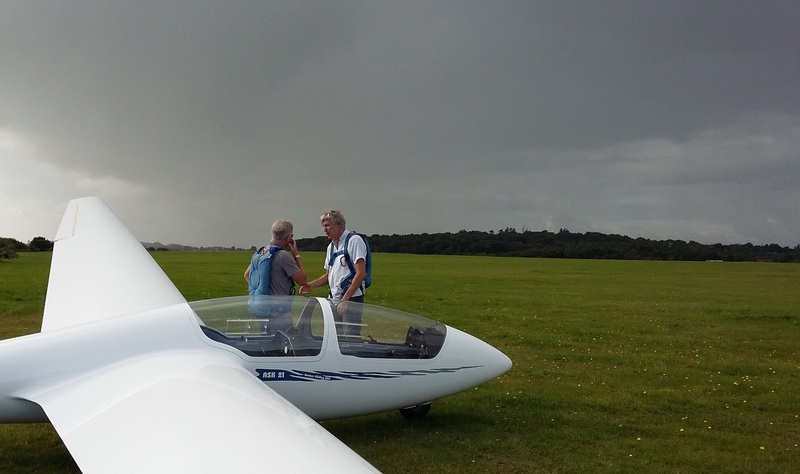 COnditions were slightly more challenging for light gliders, with a brisk southerly breeze making an unorthodox approach to take off and landing directions necessary. Hutter and Kite with a passing vintage car - an MG? Nick set up his mobile café and kept everyone going with hot drinks and biscuits. 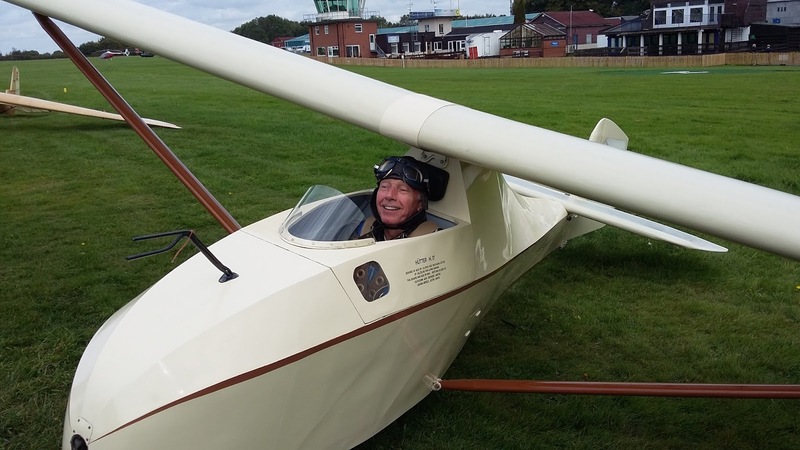 Luke Bishop went for a more modern approach and converted to the ASW19 - nicely flown in the cross wind. Meanwhile in the trailer park Rob Turner was plodding up and down pushing a motor mower, tidying up the grass for us all - thanks very much Rob! 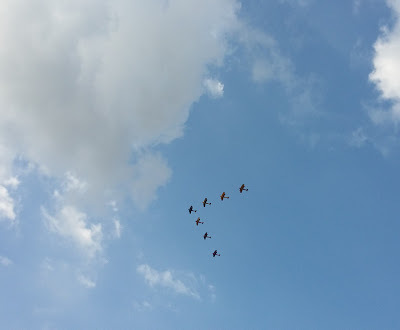 Day 1 of Whispering Wardrobes, aka International Rally of the Vintage Glider Club, saw a fine array of colourful flying machines rigged...... and flying. If you missed it, there will be more today, well worth a visit. Here is a sample. The morning started grey with Booker firmly in the clouds. 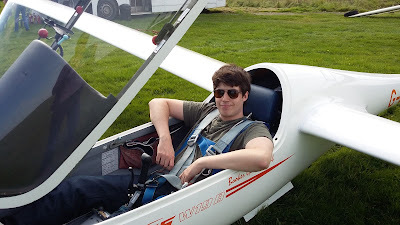 Paul took cadet Luis off to the hangar to learn the art of glider polishing. Those left in the clubhouse passed the time 'helping' James Giles mug up for his Bronze paper. He read questions out and the combined brains of 4 instructors and an airline pilot attempted to come up with a consensus on what the right answer might be. After a while we looked out of the window and decided that flying might be more fun, since blue sky was starting to appear. As well as a handful of trial lessons we welcomed Clive who took 3 flights as part of an IntroPlus course, he thoroughly enjoyed himself so I think we will be seeing more of him. Eventually a heavy shower put paid to flying and it was time for tea and biscuits. Busy day, a little breezy with a relatively small soaring window and shower dodging. We welcome Andrew Barrett onto day 2 of his PPL conversion course. 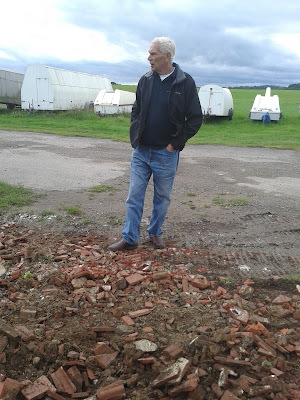 Andrew flies a Piper Tomahawk from Booker and has done for a number of years. Andrew enjoyed exploring the differences between power flying and gliding, including our rather different approach to circuit planning. Needless to say he adapted very quickly. The airfield was generally busy with pilots taking advantage of the pleasant conditions and Jan permanently sat in the Robin. We are expecting a windy night and breezy morning. The weather decided to be kind to us today and we managed to get some training done in the morning. 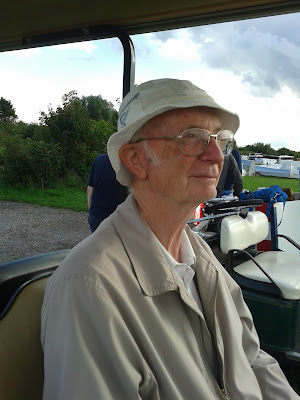 As a mark of respect to Geoff, flying ceased at midday. 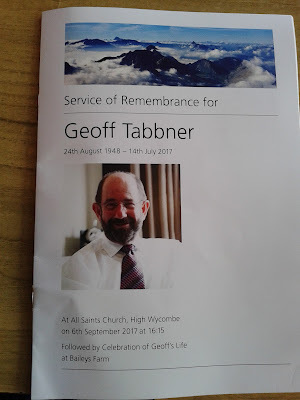 Huge numbers filled All Saints Church in High Wycombe to say a sad farewell to our friend Geoff. 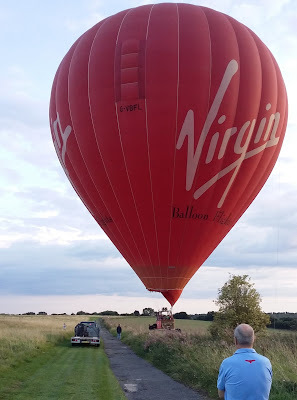 A celebration of Geoff's life was then held at the farm of Pete Wells, a spectacular practice session of the Twister air display and fireworks and very moving speeches from Geoff's wonderful family and close friends. Tuesday 5th September - How does this work, Graham? Another cloudy and wet day. The bus saga continues, removing the thingemyjig from the bus was proving problematic. Graham could be quoted as saying "we don't know what it is called, or indeed what it does - but it is broken". 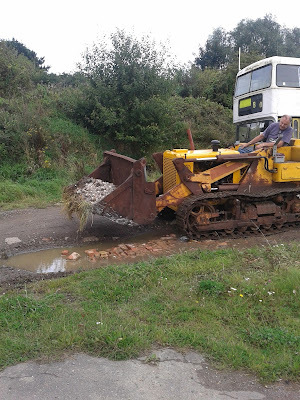 After some discussion Graham was heard to say "Oh give it here, I will have a go", the next thing he is under the bus like a ferret. It's that funny looking thing there. The next stage will be to figure out how it works, and then fix it - straightforward really. 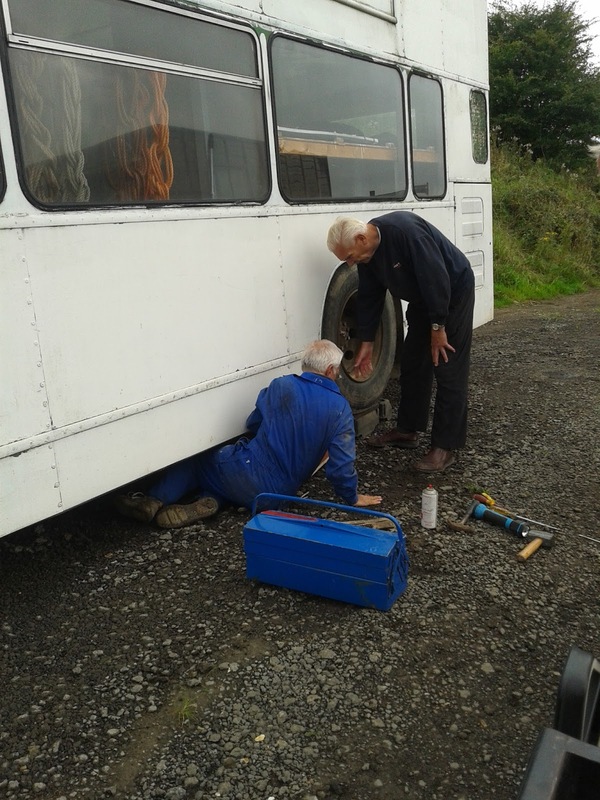 When it is fixed we will be able to use the bus at the launch point - so a big vote of thanks to the team. 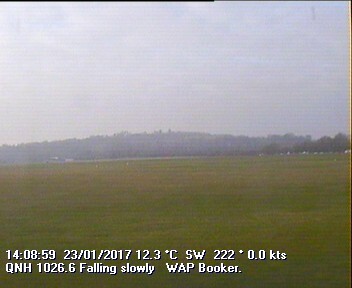 Low cloud all day, a weather front sitting over the country bringing dismal conditions - but it still all happens at Booker GC. 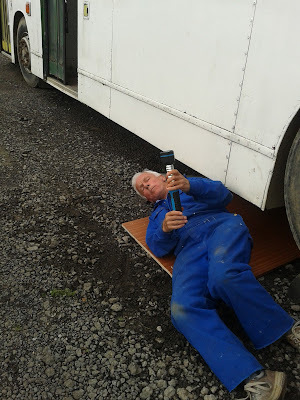 Vic said he thought the bus repair would be futile if the track in the storage area was left unrepaired, because the air valve is very close to the ground and the track is very undulating. Fix the valve and damage it again, he warned. Mmmm that's a lot better, thanks guys. Just tramp that down and we are done. Now thats what I call teamwork - another good job completed. 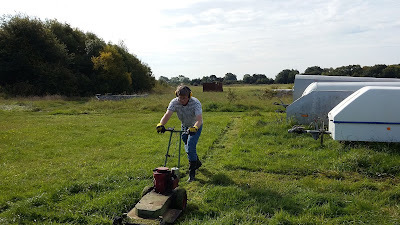 One of the hundreds of tasks completed by the silent few. 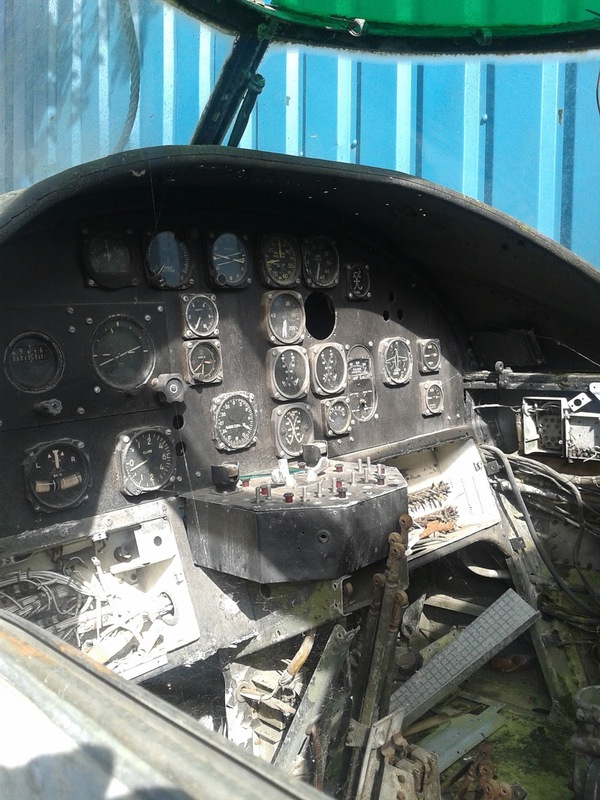 Mike was last seen trotting off to pick blackberries and Barry returned to his Aladin's cave of aircraft stuff. It was a busy day today, with instructors kept very busy flying students while the single seaters set off on a Handicapped Distance task. 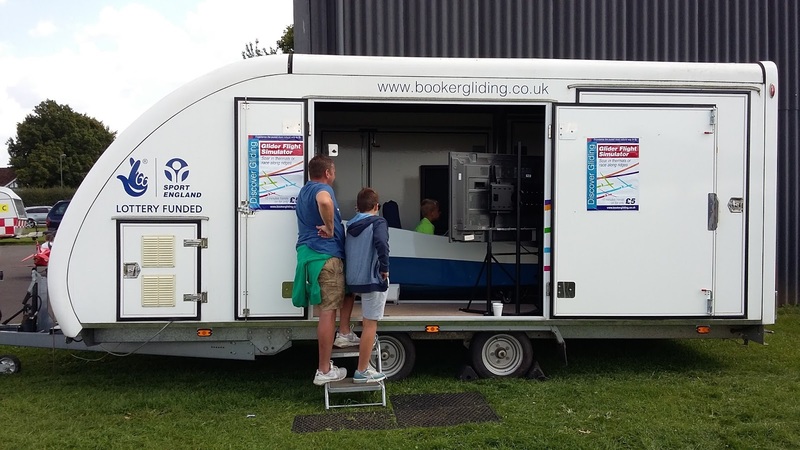 Meanwhile the marketing team was at White Waltham with the sim, invited by West London Aero Club to take part in their Members' Day, a charity fundraising event. We spent the day introducing power pilots to use of the rudder, and to spinning. We had a grandstand view of the various displays by interesting aircraft, rounded off by our own Emily Collett flying aeros in her Extra (Emily started her flying career in gliders at Booker). 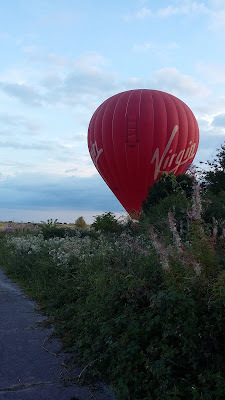 Back at Booker, the evening was enlivened by a Virgin balloon 'landing out' the wrong side of the airfield hedge. 31 August - A perfect day for Maddi Roberts to go solo. A day for dodging showers. Towering cumulus appeared as soon as the sun got to work. 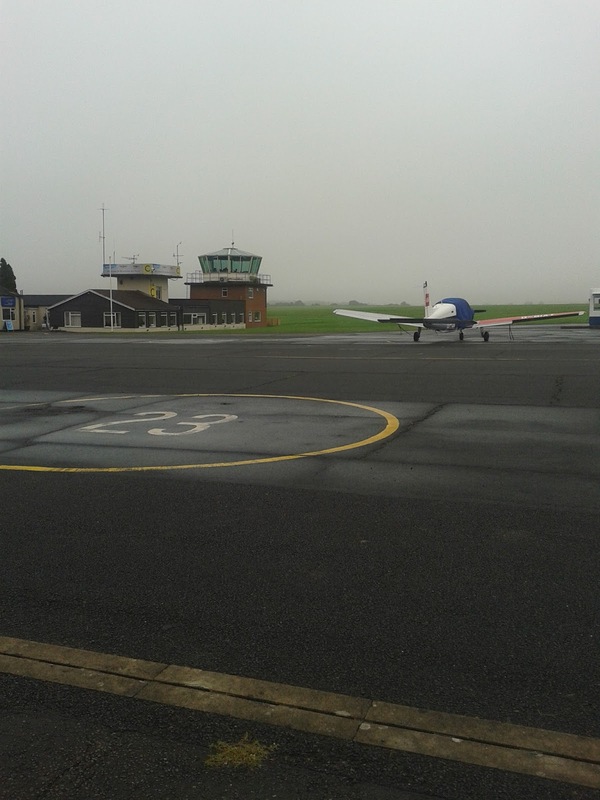 A busy day on the airfield with one serious downpour at lunchtime. 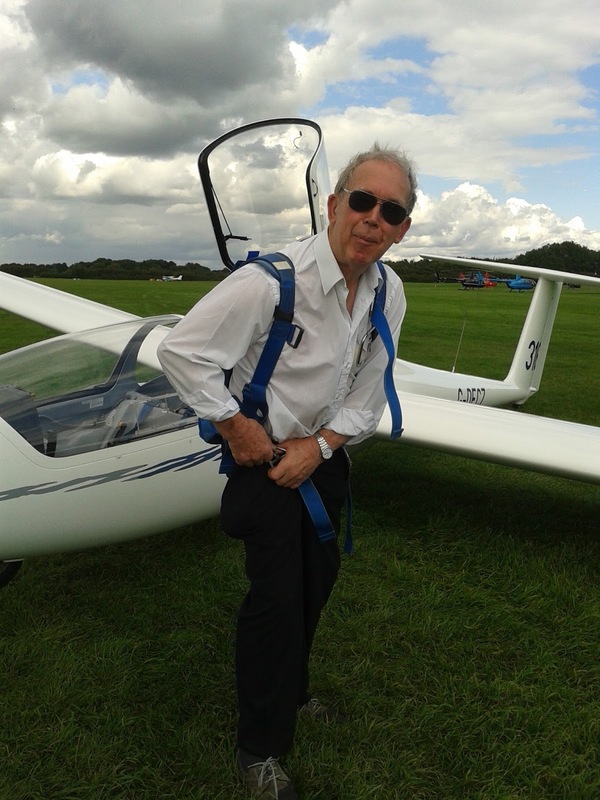 Bob Smith made many trial lesson visitors very happy as they flew with dramatic cloudscapes. 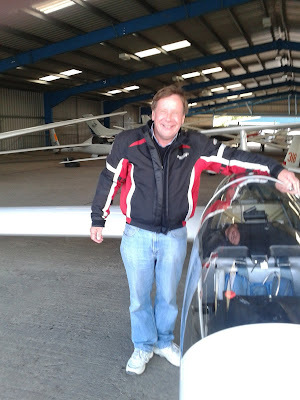 Toby O'Brien and his family all flew as did Graham Langley and Martine Hutchinson. Welcome back to Terry Clements, who spent time today getting back into the groove. 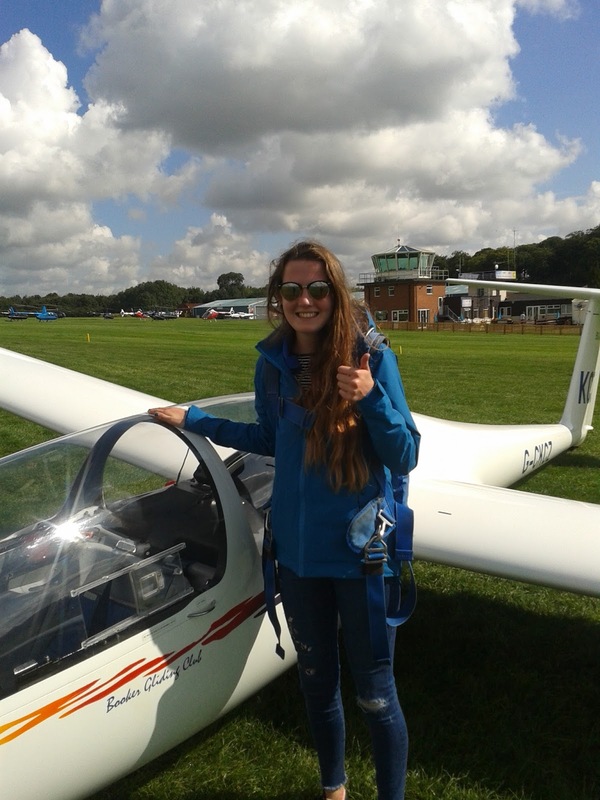 Well done Maddi, solo today---perfect landing too! Mike Shepherd preparing to get to grips with that dang aerotow, if only the tug would keep still. Meanwhile Jane and John Wood spent the day with us, enjoying the sun and Richard's attention as their instructor. Wilf explained that his Blue fronted parrot enjoys "scrunched up" cuttle fish. It's amazing the things you learn on a sunny airfield. Wilf has now realised the parrot is able to scrunch the cuttle fish up itself - saves a job! Let's hope September (that's tomorrow) brings some more good weather.